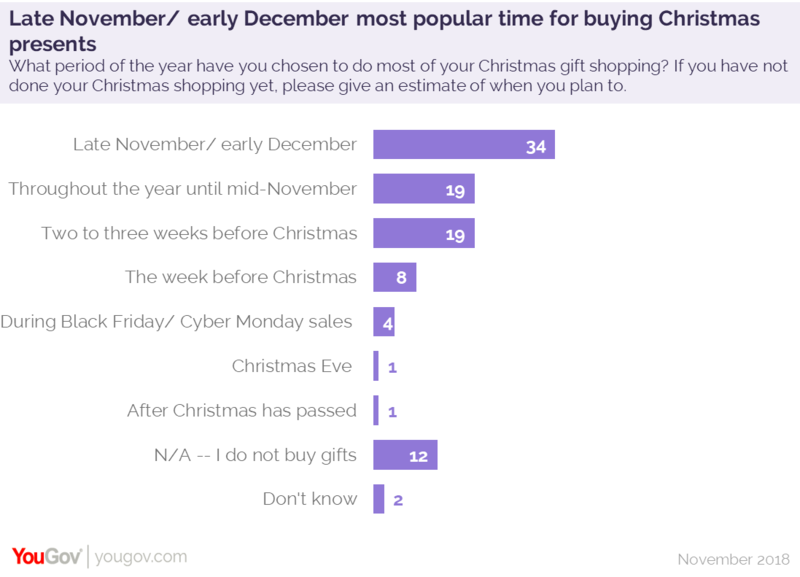 December 07, 2018, 9:59 a.m.
Nine in ten (90%) Brits say they celebrate with gifts at Christmas, and we’re currently in the peak shopping period - around a third (34%) of people do the bulk of their gift buying in late November or early December. A further fifth (19%) make the majority of their yuletide purchases later, in the two to three weeks before Christmas Day, while a more organised 19% get their shopping done by the end of November. Only 4% of people see the Black Friday sales period as a good opportunity to buy gifts. A small number (1%) wait until Christmas Eve to buy presents, and another 1% don’t get around to it until Christmas Day has actually passed. Most Brits know the people they’re buying for well: data from 2017 showed that only 9% of gift recipients were intending to return or exchange a present they’d received. 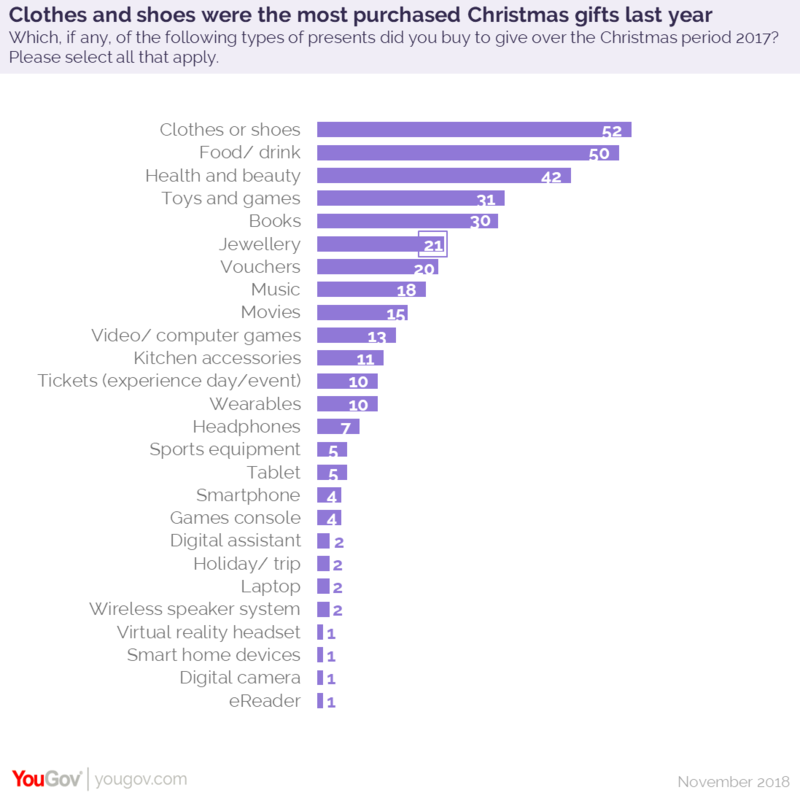 For Christmas 2017 over half (52%) of Britons gave clothes or shoes, 50% bought booze for loved ones, and health and beauty products were also a popular choice (42%). 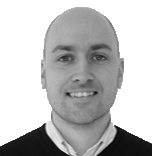 When it comes to the amount spent last year, 42% had a total budget somewhere between £100 and £400, while 14% spent nothing and 4% splashed out over £1,000. While there are some extravagant spenders, the vast majority of Brits (92%) believe that it’s the thought that counts. Over three quarters (77%) also believe that a gift is an expression of how special someone is. Beyond Christmas and birthdays, the next most popular occasions for gift-giving are weddings, when 61% of people purchase a present. The birth of a new baby (48%) and just to say thank you (32%) are also popular occasions for gift-giving. Almost two thirds (65%) of people say that the nature of the occasion is the biggest deciding factor in what they purchase, even more than the relationship with the recipient (56%) and budget (50%).